Ever since they started in the late Seventies, Girlschool have always been associated with Motörhead. They even joined forces in the early Eighties on a split-single where each band cover a song of the other. Girlschool were quite active in the early Eighties, and although they never achieved the success of Lemmy’s band, they never gave up, even though they took things at a slower pace from the Nineties on. 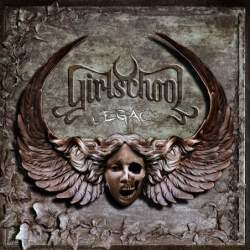 Legacy is the tenth studio album by Girlschool, leaving a happy and sad impression at the same time. The good news is that they can celebrate their thirtieth anniversary, the sad one is last year’s tragic demise of Kelly Johnson, founding member and guitarist who had to leave the band in 2000 because of her declining health. Three of the four band members have been in the band since the beginning, adding to their credibility. Can women over fifty years still be expected to rock? Yes they can! The overall mood is understandably a little melancholic, and the album needs three mid-tempo rockers before Spend Spend Spend brings a first smile to my face. From here on, the album continues with varied songwriting, surprising again and again with tremendous songwriting, as on the punkish Just Another Day or Still Waters with its Sixties flavoured chorus, proving that the old ladies can still sing heartbreakingly. Fifteen songs may be quite a lot for a classical hard rock album, but again Girlschool managed to pack some surprises in the second half. Embracing their connections with Motörhead, they cover Metropolis, and later themselves with their early single Emergency, a track that was covered by Motörhead years ago. Lemmy not only plays bass and triangle on the fast Don’t Talk To Me, but even adds his raspy voice. There are solos by Phil Campbell and even Fast Eddie Clarke. Such a joyful reunion must bring the tears to the eyes of every self-respecting hard rock fan. Twisted Sister guitar tandem J.J. French and Eddie Ojeda also play solos. The album’s third track I Spy is later on performed in an alternative version with Tony Iommi on guitar and Ronnie James Dio on vocals, making this something like an authentic Black Sabbath song. Some old bands had better stop making music, but no so Girlschool. They have aged with dignity, and although their music has a more reflective nature than in the past, Legacy is full of hits and surprises, making this one of the best albums of a veteran band ever. Let’s hope that the girls will remain among us for many more years to come!